Fire blankets for welding are essential hot work protection for personnel, equipment, and plants. 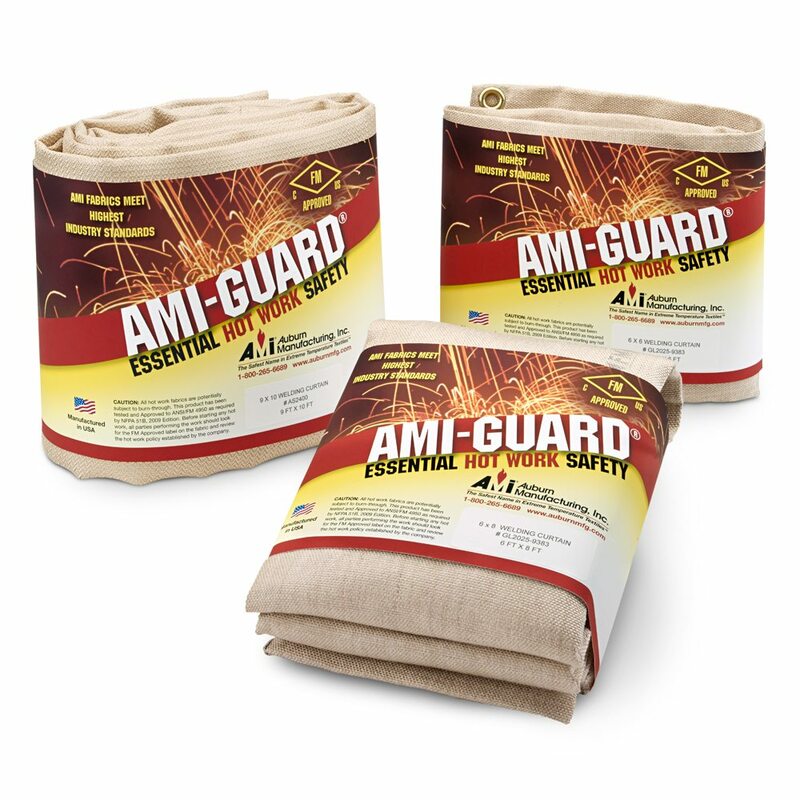 AMI-GUARD® is the name of AMI’s line of high-performance FM approved welding blankets and safety products. Custom sizes and styles available upon request, with or without grommets or other special hardware. If you are buying the product for resale, we can provide individualized heat-shrink packaging upon request…at no extra charge. We can even supply samples of Hot Work Permits. Other Welding Blankets are available as rolled goods in 36″ – 72″ widths and are FM Approved Welding Curtains, Blankets, and Pads. They have been tested and rated to the ANSI/FM 4950 Standard that now is required by the NFPA 51B 2014 Standard. The rating system makes it easy to determine which of the three levels of fire protection – welding curtains, welding blankets, or welding pads – is needed for a specific hot work operation. Call Customer Service at 1-800-264-6689 or Get a Quote Today! AMI-Guard Welding Blankets — intended for use in HORIZONTAL applications with LIGHT to MODERATE exposures to sparks, heat, and molten metal slag. Welding protection blankets are designed to protect machinery and prevent ignition of combustibles, located in the designated work area. AMI-Guard Welding Pads — intended for use in HORIZONTAL applications with SEVERE exposures, such as that resulting from molten substances or heavy horizontal welding. Designed to prevent the ignition of combustibles that are located adjacent to the underside of the pad. AMI Guard Welding Curtains — intended for use in VERTICAL applications with LIGHT to MODERATE exposures to sparks and heat, such as that resulting from chipping, grinding, heat-treating, sandblasting and light horizontal welding. FM approved welding curtains are designed to prevent sparks from escaping the designated work area.